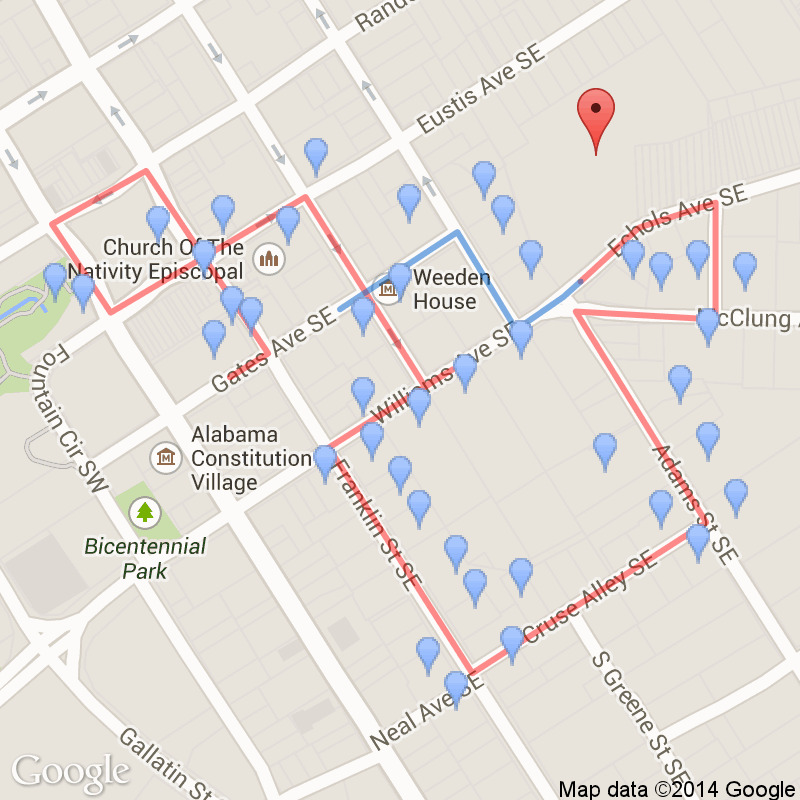 Continue through the lane and turn left at the end of the lane which is Echols Street. 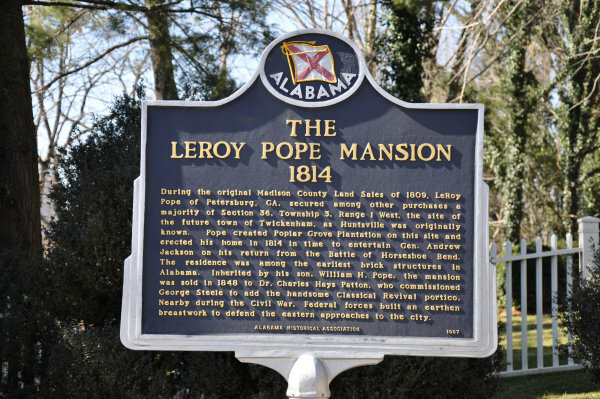 Go down the hill to pause at the historical marker for the LeRoy Pope Mansion. 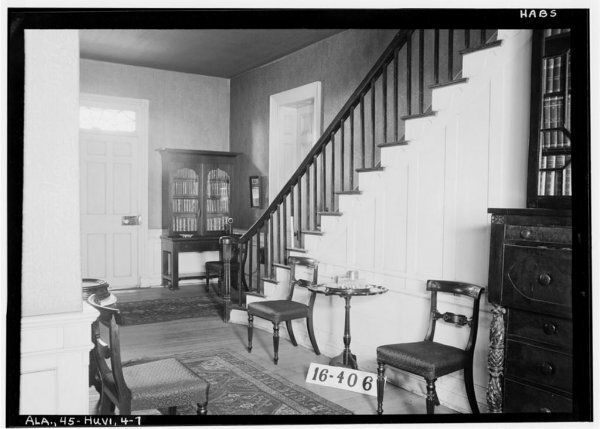 This display marks the LeRoy Pope House, 403 Echols, built in 1814. Can you see the stately columns through the trees? 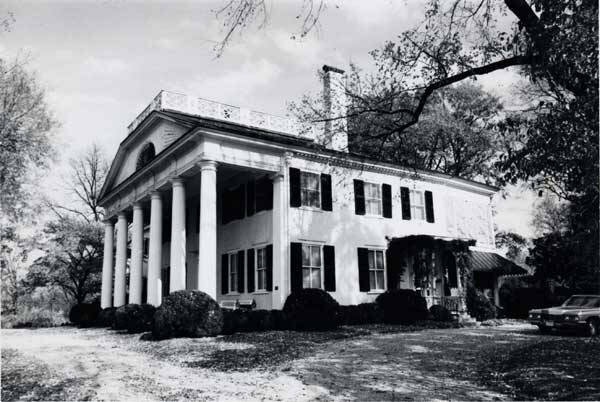 This is the oldest documented mansion in Huntsville and was built by the man considered to be the father of town. 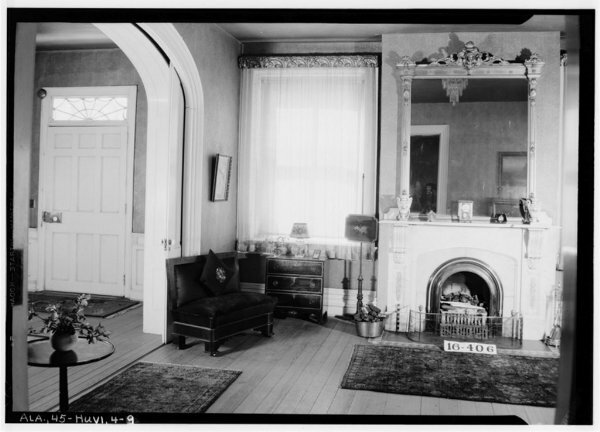 LeRoy Pope and his friends were actively involved in the early political, economic and cultural development of town. Pope was so sure of his position, he renamed the town Twickenham after the name of the English country estate of Alexander Pope, the poet. This did not set well with the other settlers, who quickly had the name returned to Huntsville after their friend and comrade, John Hunt. 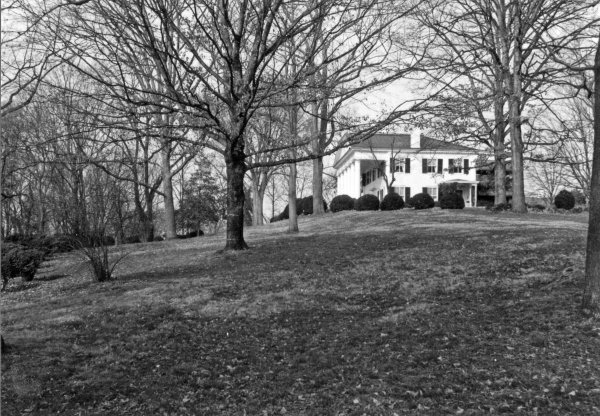 Pope choose this site on the highest hill, overlooking the growing community and he named the house Poplar Grove. The materials for its construction were brought down the Tennessee River from Chattanooga on flatboats to Ditto's Landing, Whitesburg, as we know it today, and then the material was transported the twelve miles to this location by wagons. 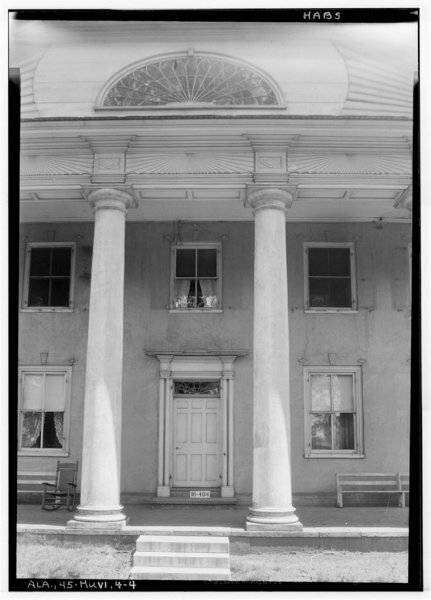 Here in May, 1814, Pope hosted a public dinner on the lawn for General Andrew Jackson and the soldiers returning from their triumph against the Creek Indians at the Battle of Horseshow Bend. The men were eager to return to their homes, but they lingered here one afternoon. Can't you just see the tired soldiers, dust under foot, children running and cheering, a dog or two barking alongside. A grateful village welcomed the victors who had saved them from the death at the hands of the dreaded Creek Indians. Now you might understand that old saying, "God willing and the Creeks don't rise," has nothing to do with water or rainfall. 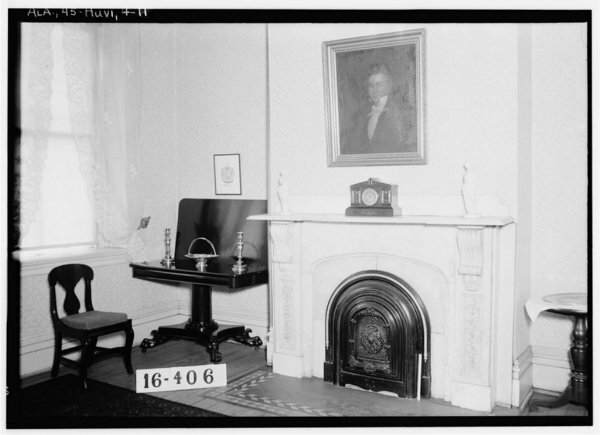 Ah, that evening, speeches were made on the Square and the enlisted men were fed and toasted at the Bell Tavern. 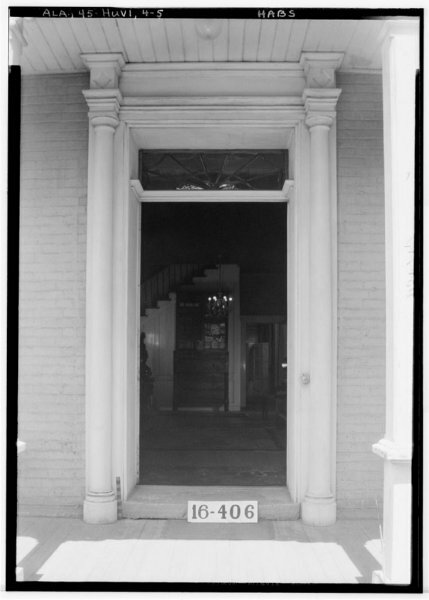 Jackson and his officers joined LeRoy Pope and a few of his friends, well, so many that they couldn't fit into the house, and festivities spilled onto the yard. Nineteen toasts were made in the twilight as a select crowd raised their glasses. 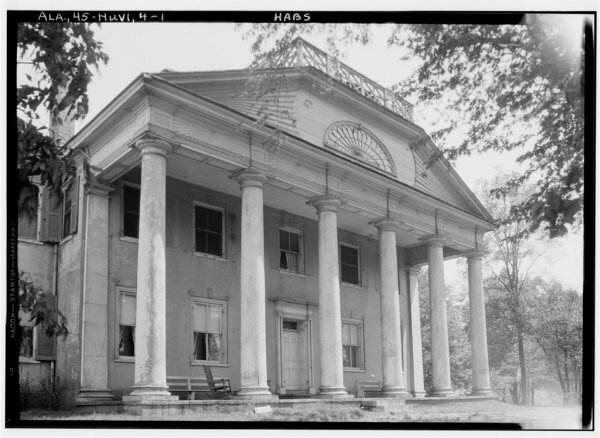 That evening, most likely on these grounds, were five men who would become Governor of the State, six men for whom counties were named and one man who would become President of the United States. 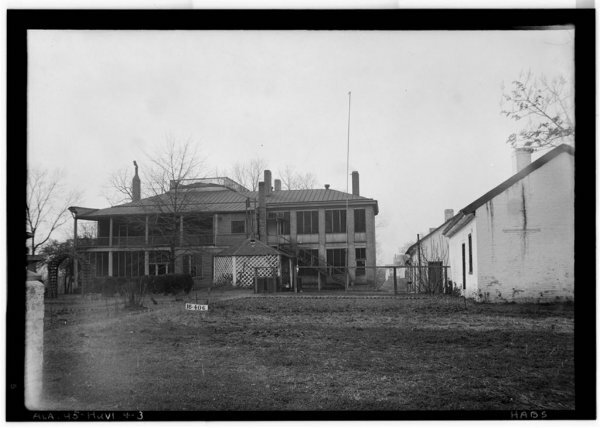 During the original Madision County Land Sales of 1809, LeRoy Pope of Petersburg, GA. secured among other purchases a majority of Section 36, Township 3, Range 1 West, the site of the future town of Twickenham, as Huntsville was originally known. 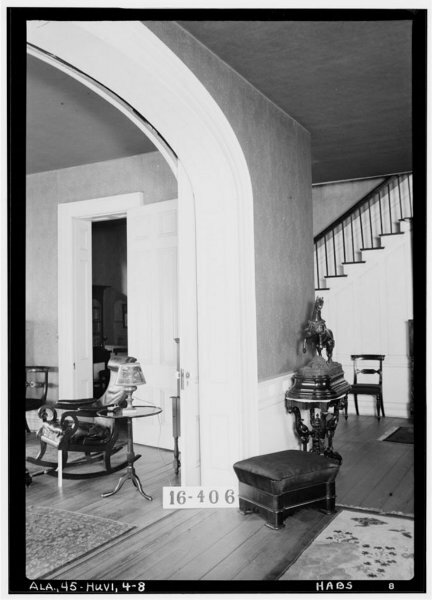 Pope created Poplar Grove Plantation on this site and erected his home in 1814 in time to entertain Gen. Andrew Jackson on his return from the Battle of Horseshoe Bend. 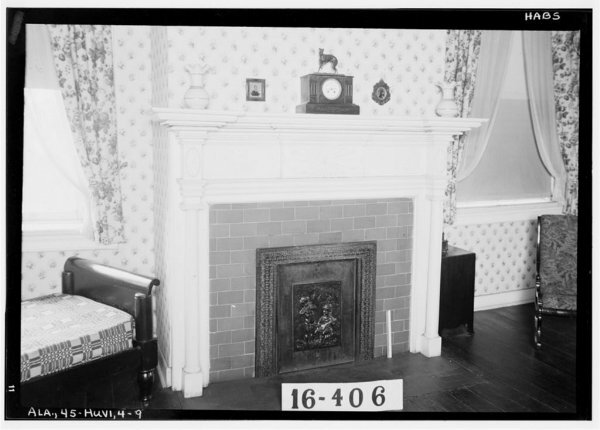 the residence was among the earliest brick structures in Alabama. 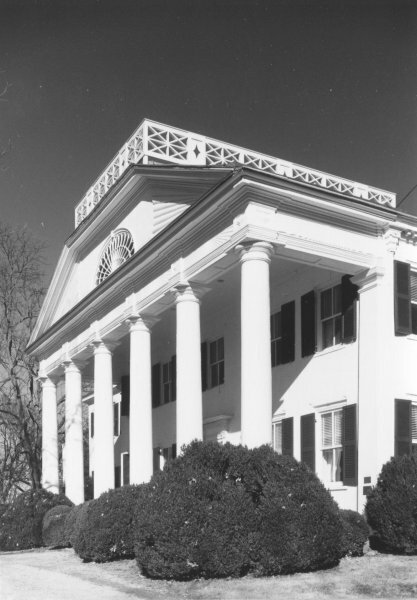 Inherited by his son, William H. Pope, the mansion was sold in 1848 to Dr Charles Hays Patton, who commissioned George Steele to add the handsome Classical Revival portico. 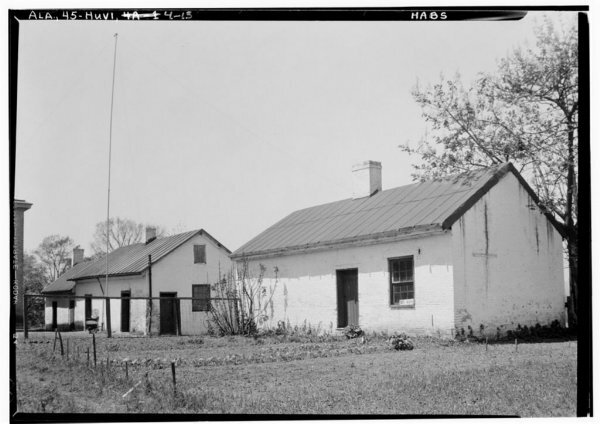 Nearby during the Civil War, Federal forces built an earthen breastwork to defend the eastern approaches to the city. "Portrait of LeRoy Pope, a wealthy Georgia planter who founded the city of Huntsville. 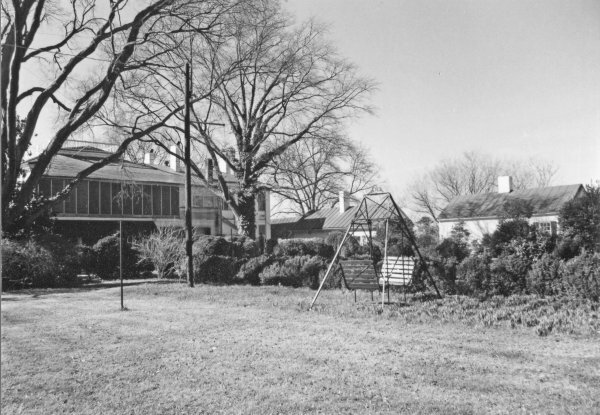 Pope bought the quarter section of land around Big Spring Park for twenty-three dollars an acre, but later donated it to the town. 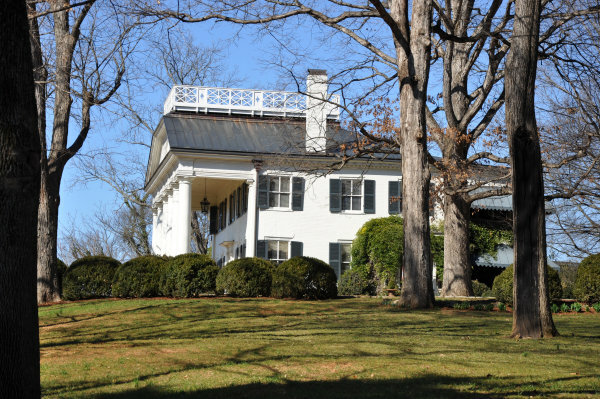 He built his mansion atop Echols Hill in 1825. Although the plate on this portrait gives the dates for Pope as 1763-1844, his tombstone in Maple Hill cemetery reads 1764-1845." "The Pope Mansion. 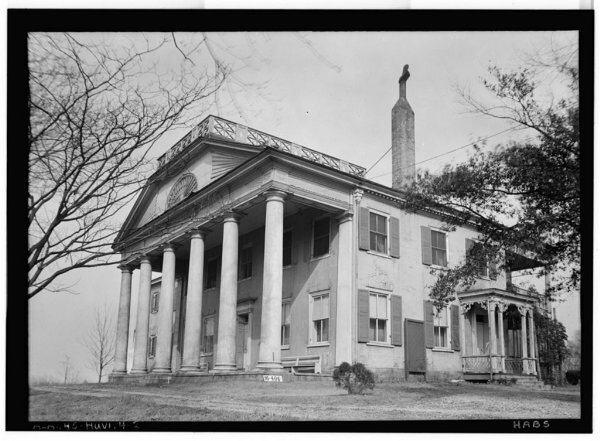 Located on Echols Hill at 403 Echols Avenue, the LeRoy Pope Mansion was built in 1815 by architect George Steele on a twenty-five and one-half acre plot. 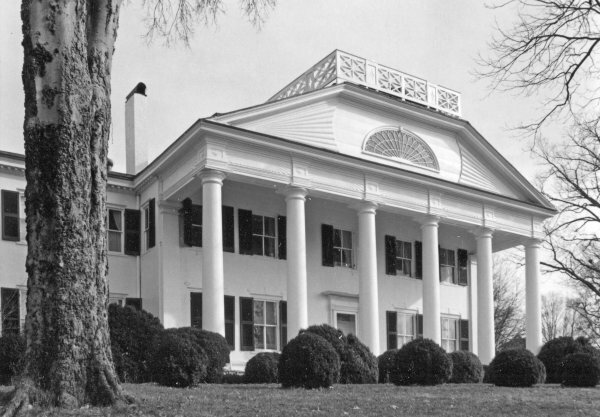 It was the first mansion in Huntsville. 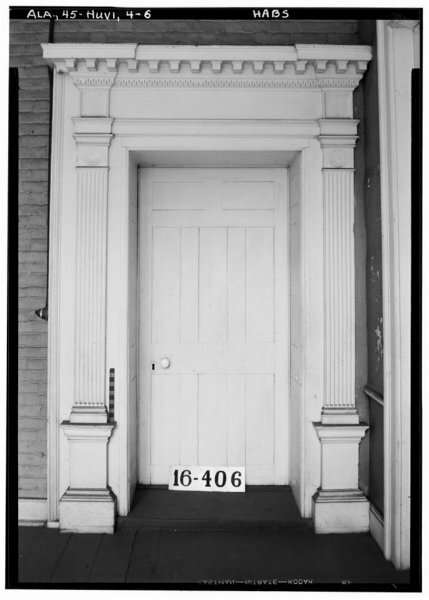 Bricks for the house were made in Tennessee, transported by flatboat to Ditto's Landing, and then hauled by wagon to the building site." 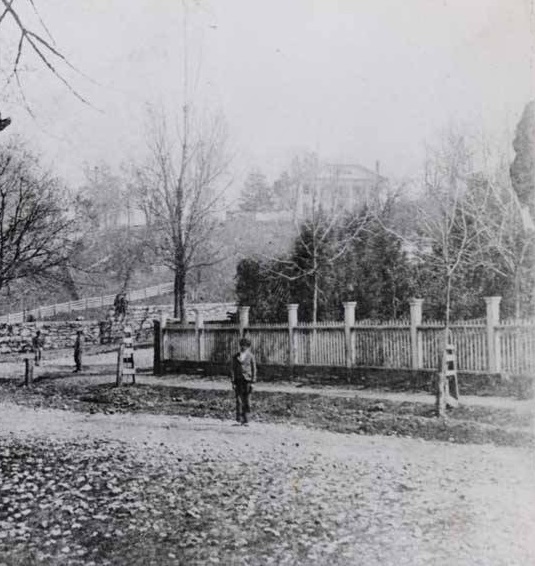 A view of the Pope mansion on the hill from the corner of Eustis St. and Lincoln St.